Quiche is a great use-up-your-veggies-in-the-fridge dinner option, and this week we were craving it. Though there was no pie crust in the house, we used shredded potatoes and filled it with the vegetables in our fridge. 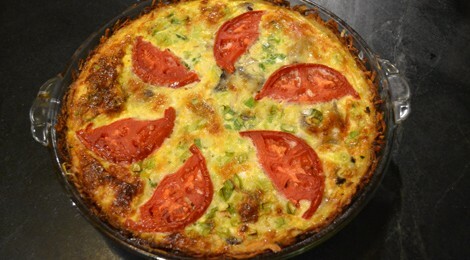 This quiche became a unique, grain-free dinner (or breakfast) option for everyone to enjoy. Saute mushrooms in butter until soft, a few minutes. Salt and pepper to taste. Set aside. Steam spinach for a couple minutes in water, or saute in butter until wilted. Drain in colander squeezing out any extra liquid. Bake crust in oven at 425° for 15 minutes or until edges are golden and starting to crisp. Remove from oven and allow to cool. Layer mushrooms, spinach, tomatoes, and onions in the pie pan, distributing vegetables evenly. Top with Gruyere cheese and Parmesan. Combine milk with beaten eggs, and whisk adding salt and pepper. Pour egg mixture over veggies and cheese. Bake at 375° for 30-40 minutes, or until top is golden and toothpick inserted comes out clean.